Any of various arachnids of the order Scorpionida, of warm, dry regions, having a segmented body and an erectile tail tipped with a venomous sting. Scorpion, common name for arachnid having a flat, narrow body, two lobsterlike claws, eight legs, and a segmented abdominal tail. Terminating in a venomous stinger supplied by a pair of poison glands, the tail is usually curved upward and forward over the back. 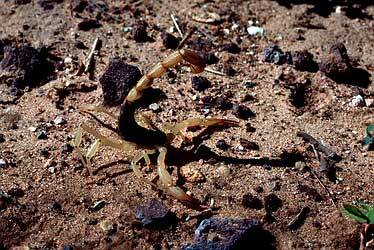 About 1400 species of scorpion exist; about 40 of them occur in the United States. Scorpions are usually brown in color and range from about 2.5 to 20 cm (about 1 to 8 in) in length. Found in warm and dry tropical regions, including the southwestern United States, the scorpion is nocturnal and feeds mainly on spiders and insects. The young are born live and remain with the mother for a short period. When capturing a victim with its claws, the scorpion inflicts a disabling sting with its tail. In most species the sting is painful, but not fatal, to humans, although the sting of one species found in the United States has proved fatal to young children and is potentially fatal to adults. Other areas of the world have more dangerous scorpion species; the poison involved is a neurotoxin, attacking the nervous system. Scientific classification: Scorpions belong to the order Scorpionida in the class Arachnida. The one potentially deadly species found in the United States is classified as Centruroicles sculpturatus. a scorpion wouldn't strike without provocation. they really just like to be warm and under a rock all day. 420 millions of years ago they were more than 3 feet long and lived under water. their mating ritual is a dance. and they kiss. females carry their young on their backs and feed them. many breeds flouresce under ultraviolet lighting. they often live 5-25 years and possess amazing metabolic systems. they can survive extreme temperatures, some, nuclear blasts. they live on every continent in the world, except antarctica. certain breeds are known to track their directions by the stars and moon. they have eyes on the front and the back of their heads, and their hearts run the full length of their bodies. some frogs eat scorpions. some scorpions eat frogs.